Strongest El Niño on Record Causes High Temperature and Less Precipitation Across South and Southeast Asia – Weathernews Inc.
Weathernews Inc. (Chiba, Japan; Chihito Kusabiraki/CEO) has analyzed the strong El Niño pattern that has persisted since 2014 and its relationship with the high temperatures and low rainfall across Southern and Southeast Asia, and also produced an outlook for the event. At present, this El Niño, which has been called the strongest on record, is weakening but remains in place. As a result of the El Niño, the Mekong Delta region of southern Vietnam has been suffering the worst drought in a century since January of this year, and India is suffering the effects of a major heat wave. It is forecast that this high temperature and low rain trend will continue through June and July, with further hazards expected. Weathernews continues to monitor the El Niño trend and effects across the region. The El Niño event that began in the summer of 2014 and has been described as the strongest on record, is in a weakening state. Looking at Figure 1, the Sea Surface Temperature (SST) near the equator, in the area boxed by the green dotted lines, has been steadily decreasing since January 2016. The El Niño event will continue to weaken through July, with SST coming back within average. Even with the weakening, the SST in the tropical eastern Pacific ocean are still about 3°C higher than normal. 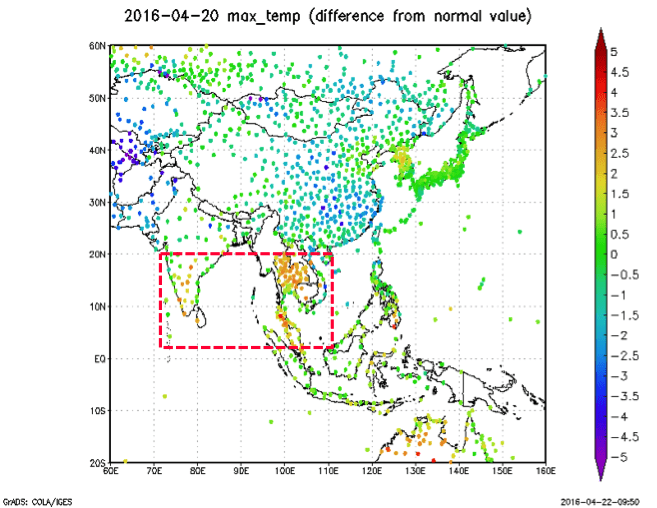 In March through May of years under El Niño influence, South and Southeast Asia not only see higher temperatures, but Southeast Asia, especially the Indochinese Peninsula, also see less rain (Figure 2). Figure 2: Weather trends of Mar-May during an El Niño event (Source: JMA). Area outlined in the black dotted line show high temperature/low precipitation zone. When El Niño occurs, increased SST across the tropical eastern Pacific Ocean causes updrafts, which can create rain clouds. The air that rose in the east then descends over S/SE Asia creating high pressure, and makes it less likely for rain clouds to form, and generally fair skies lead to higher temperatures (Figure 3). This year fits this pattern, leading to droughts and heat waves across S/SE Asia. The Mekong Delta in southern Vietnam has been suffering a drought since January of this year, leading to large damage to farming. India has also been under a heat wave in April. From Figure 4, we can see that South and Southeast Asia have been under a trend of high temperatures. Looking at all of India it has been about 1°C higher than normal whereas the Indochinese Peninsula has been 2°C higher. There is the risk for adverse effects such as droughts and heat waves even in regions that have not yet reported damages. The El Niño pattern is forecast to weather through late July, and return to normal. However, this El Niño was especially strong, so temperatures across the world are in the higher side. Therefore it is expected to take some time before this return to normal, so the high temperatures and low rain over S/SE Asia are forecast to continue. According to the temperature anomaly forecast for May to July, 2016, the temperatures across S/SE Asia are expected to normalize by the end of July. However, India and Indochinese Peninsula are expected to remain 2 degrees higher than average through May (Figure 5). The rainfall anomaly forecast for the same period shows parts of SE Asia will remain less than average (Figure 6). This will combine with the higher temperatures and may result in droughts not only in Vietnam but across the entire Indochinese Peninsula. 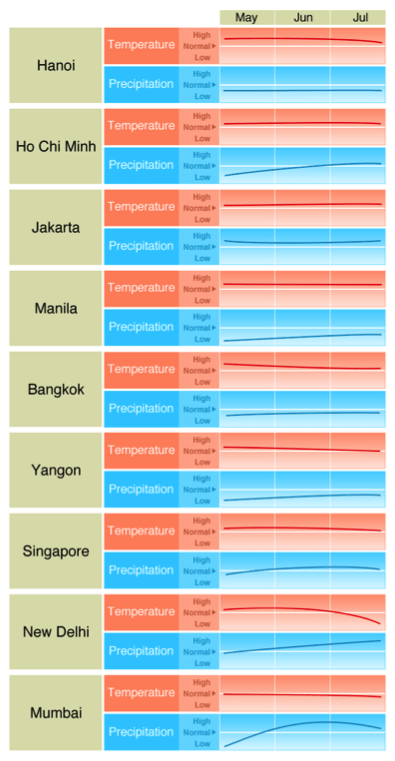 Figure 7: Precipitation and Temperature trends through July at major Asian cities. The increased temperatures in western Thailand and Myanmar are forecast to continue through at least the next month. The El Niño pattern is forecast to weaken through the end of July, as well as the change of season, will allow temperatures across S/SE Asia to gradually return to normal levels (See Figure 7). 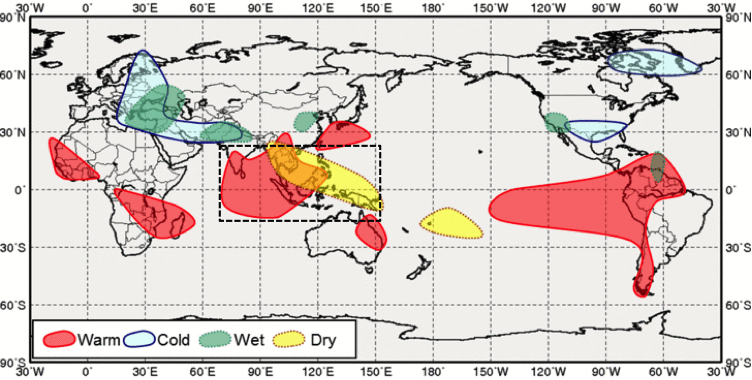 With regards to precipitation, northern India as well as Java and Kalimantan Islands in Indonesia are forecast to receive more rain than normal after July. This is due to the clear skies seen over S/SE Asia in El Niño years, which allows the SST in the Indian Ocean to become warmer. The warmer SST results in an environment where it is easier for convective activity to occur, which can lead to increased rainfall. After August, the SST in the tropical eastern Pacific are expected to be lower, and it is possible that a La Niña event may start. Weathernews will continue to monitor the weakening of the El Niño and the possible start of La Niña.